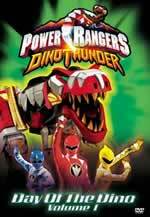 The unstoppable Power Rangers series continues with this latest installment, Dino Thunder. Fans of the show can rest assured, though, that the requisite ingredients of fighting and cheesy jokes are still in abundant supply. This collection from Buena Vista Home Entertainment collects the first three episodes of the series. The first episode, entitled “Day of the Dino – Part 1,” introduces us to the central characters of the show. Dr. Tommy Oliver (Jason David Frank) is starting his new job as a science teacher at a local high school, when he’s assigned by the gruff principal to watch over the students in detention. As he already had plans to take a trip to a nearby fossil site, Oliver decides to take the students – Conner (James Robertson), Ethan (Kevin Duhaney), and Kira (Emma Lahana) – along with him. The kids, being curious, decide to head off on their own and explore – but find trouble after stumbling onto three crystals that give them unusual powers (ie Conner can slow down time). The episode ends on a cliffhanger note, with Kira kidnapped by the villainous Mesogog. The cliffhanger is resolved in “Day of the Dino – Part 2,” which finds the three students transformed into Power Rangers. Dr. Oliver informs them of their new role, which seems to mostly involve combating evil Tyranodrones. Their first task comes when Mesogog releases three gigantic dinosaurs into the city center, where they begin wreaking havoc. With the help of Dr. Oliver – or Dr. O, as they’ve taken to calling him – the Power Rangers use their powers to take down the humongous creatures. The final episode is called “Wave Goodbye,” and finds our intrepid heroes learning the unpleasant lesson that being a Power Ranger means putting everything else in their lives on the backburner. Midway through an important soccer tryout, Conner is called into the fray by Ethan and Kira – but when he returns, Conner discovers that he was disqualified for leaving the tryout early. Meanwhile, Kira is busy preparing for a gig at a local hangout – where she also has a crush on the new waiter. The episode ends with a cliffhanger, presumably in an effort to encourage viewers to pick up the next volume. Audio: All the episodes in this collection are presented in 2-channel Dolby Digital Surround. Though there’s nothing amazing about the sound quality here, it is clear enough to get the job done. Video: The full-frame transfers are expectedly quite crisp, with absolutely no instances of artifacting. Extras: In a feature entitled Virtual Trading Cards, users can select a character and learn information about them. And in Ninja Moves, we’re shown some simple martial arts techniques. The disc also includes two bonus episodes, though for the Ninja Storm series (“The Storm Before The Calm – Part 1” and “The Storm Before The Calm – Part 2”). Finally, the DVD includes the requisite Disney Sneak Peeks (Spider-Man: The Venom Saga, Aladdin: Special Edition, Bionicle 2, and Spider-Man VS Doc Ock). Conclusion: Power Rangers Dino Thunder offers up exactly what viewers have come to expect from the series – likable characters, silly jokes, and lots of action. Fans won’t be disappointed.